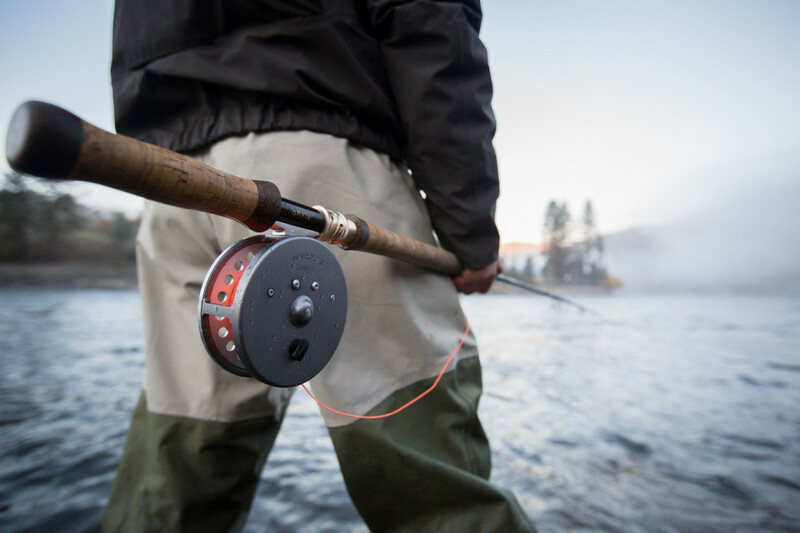 ASK A TRAVELING FLY FISHER their favorite North American trout destination and they’ll likely spill about drift boating the majesty of Montana’s Big Sky country, wading the tumbling pools of Colorado’s steep freestones, or spey casting the sweeps of Oregon’s coastal rivers. Ask that traveling fly fisher where they can find all these opportunities in one location, and they may struggle to answer. That is — of course — if they’ve never been to Sun Valley. 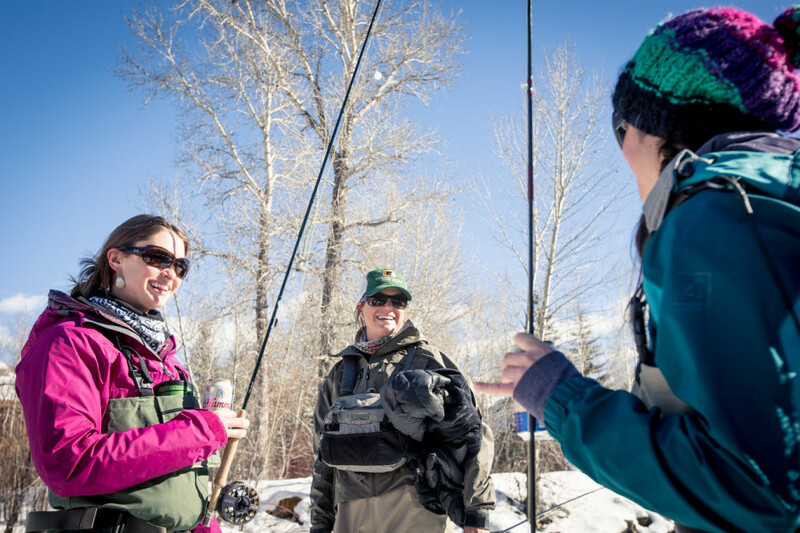 The Sun Valley area offers an incredible diversity of fly fishing opportunities for everyone from the casual novice to the ambitious expert. Time to buy a stack of postcards for Mom, because you’ll have plenty of fish stories to tell after wading our local waters. The fabled Big Wood River provides immediate local access to miles of classic, riffle-run-pool trout fishing. Our “bread and butter” watershed, the broken surfaces of the water cater well to the first-timer or anyone still cultivating their stealth and technique. That said, swift water and lots of structure make for plenty of technical opportunity for the more advanced angler. The bountiful rainbow trout, averaging 12-14 inches, sip eagerly at sporadic mayfly hatches throughout the summer days, often leading into prolific evening caddis hatches. Winter midge hatches will test and improve the willing angler’s skills and patience. Nymphing is productive year-round, and can often produce larger fish. A recent influx of massive brown trout in the river will keep the streamer junky content, no matter the month. And thanks to its proximity to Sun Valley, the Big Wood River is an option even if you’re burdened by time constraints. Warm Springs Creek is a tributary that meets the Big Wood right in Ketchum, but upstream portions of offer a feeling of remoteness just a few miles out of town via a mellow dirt road. The small freestone creek, which runs through wildflower meadows, holds stocked rainbow trout as well as a population of wild rainbows that often exceed expectations in terms of size. Warm Springs supports bugs similar to those found in the Big Wood, and thus fishes very similarly. Mule deer, elk, and moose frequent the valley floor, and there’s basic camping right along the river for those looking for a brief and simple getaway. A 40-minute jaunt over the scenic Trail Creek Pass will take you to the high-desert solitude of the Lost River drainage. 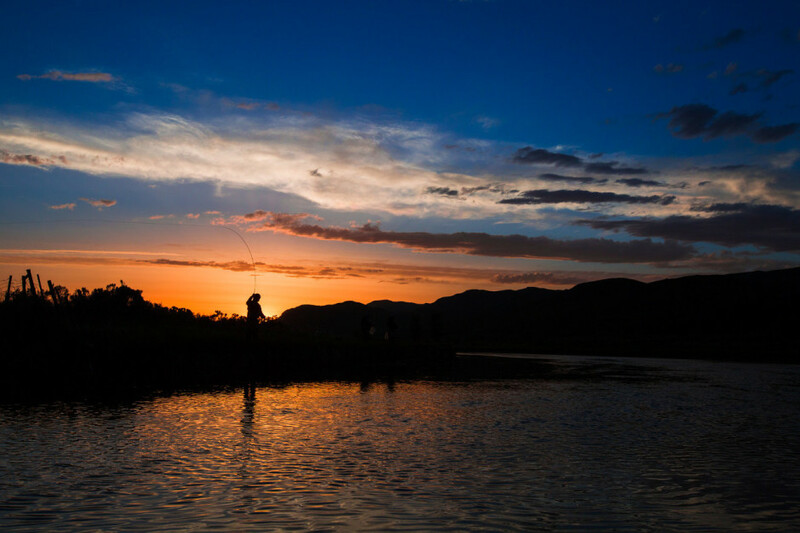 Anglers can spend days wading the emerald tributaries and the main river with the Pioneer Mountains at their back. While hatchery rainbows are abundant around stocking access points, fish are relatively scarce. That said, the vividly colored wild cutthroat you’ll inevitably run into are of the highest quality. Fish exceeding 20 inches aren’t uncommon, and they’ll usually willingly eat an enormous foam dry fly. Covering water is the name of the game, which suits the fisher just fine, as the twisting river frequently drops into small canyons and constantly piques curiosity as to what lies around the next bend. Plus, the watershed holds a smattering of small but mighty Arctic grayling — a rare commodity in the Lower 48. Camping is ample, as are the stars in the night sky. About 40 miles south of Sun Valley lies Silver Creek. Often hailed as the “crown jewel” of spring creeks in the Rockies, this river gains its fame in the upper section on land owned by the Nature Conservancy. The organization welcomes the public to test their skills and patience while casting to an abundance of plump rainbows and massive brown trout. Songbirds, raptors, waterfowl, moose, deer, and elk frequent the preserve and are often part of the landscape as you diligently work your tiny fly to the gorgeous trout. A mellow gradient offers the opportunity for a pleasant float-tube drift through the clear waters. A plethora of mayflies provide prolific hatches that the fish selectively key in on, and the placid surface of the water demands a fly presentation that sometimes exceeds even the craftiest of caster’s abilities. Still, novice anglers shouldn’t be deterred from wetting their legs in this spectacular river — as fishing often goes, anything can happen. Among the greatest highlights of fly fishing around Sun Valley is our proximity to the Salmon River; its headwaters are about an hour’s drive north of town. 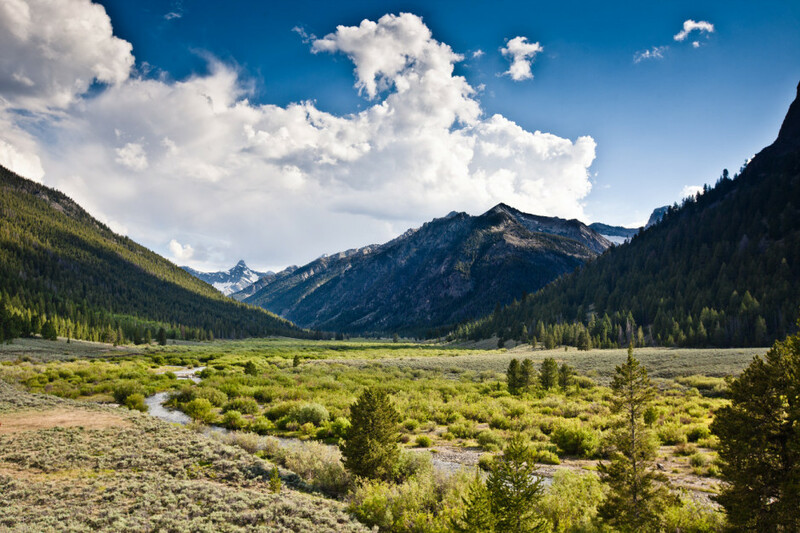 At the foot of the Sawtooths, summertime visitors can walk and wade or bounce down the steep, boulder-strewn river aboard a drift boat as they cast stonefly imitations to wild cutthroat trout. While fishing to these waterborne warriors, anglers frequently tie into bull trout that can reach nearly 30 inches. Perhaps the most appealing perk of the Salmon River, however, is that it hosts runs of steelhead in the spring and chinook salmon in the summer. Whether swinging flies on a spey rod or bobbing nymphs on a single-hand, this is a unique opportunity for an angler in the Rocky Mountains. Hook either of these behemoths, and your fly fishing career will be forever altered. The levels of access are unreal. Anglers often get lost in dreams of what lies around the next river bend, only to turn the corner and be crashed back to reality by a fence across the water and a sign that reads, “PRIVATE WATER — MEMBERS ONLY.” But around Sun Valley, the fly fisher can dream on, hour after hour, day after day, bend after bend. Idaho state law designates the land within a navigable river’s high-water marks as public trespass right-of-way. Consequently, once you’ve entered a river from an appropriate access point, you can wade as far upstream or downstream as you like. This, however, is rarely a consideration, because such an enormous amount of our fisheries lie in public lands. Even our more privately bound rivers, such as the Big Wood, have countless public easements to access the water. Not to mention, most Big Wood homeowners welcome the presence of amicable fly casters in their view of the river. Many even maintain a trail for fishermen on the edge of their property. The sun (practically) always shines here. You’re right next to an incredible community.